The neglected clubfoot deformity is a problem of poorer developing countries. It is the most common congenital problem leading to locomotor disability. Approximately 80% of children born with a clubfoot deformity are born in the developing world, and the large majority of these do not have access to appropriate medical care. The obstacles of poverty, lack of awareness, and lack of appropriate medical resources in accessible locations mean that treatment is either not initiated or incompletely performed. The orthopaedic literature on clubfoot deformity focuses on early intervention in a resource-rich environment, with numerous surgical options outlined for both primary treatment and treatment of the relapsed clubfoot. There is very little literature available on treatment of the neglected clubfoot with major texts providing little more than anecdotal reference to triple arthrodesis as a salvage. Orthopaedic surgeons visiting countries in the developing world for volunteer or teaching assignments cannot help but be struck by the large numbers of children seen, the product of high birth rates in most developing countries, and the large numbers of children with neglected clubfoot deformities presenting to outreach clinics. Deciding how to manage and treat these children, therefore, becomes a significant challenge. 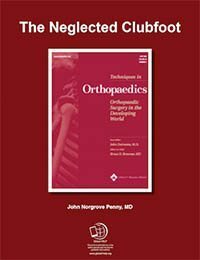 The purpose of this article is to provide a practical algorithmic approach developed by the author over a six-year span of full-time work in Uganda, East Africa, while developing a Children's Orthopaedic Rehabilitation Project. During this time, more than 500 surgical procedures were performed for neglected clubfoot deformities. Most of the surgical procedures can be accomplished with basic surgical instruments in the low-technology environment of the developing world. Indonesian translation by Sudjati Adhinugroho. Russian translation by Nataliia Moskalenko.